Disability Unemployment Rates | Propel L.A. In general, unemployment rates continued to decrease every year since 2012. However, there is a significant disparity between persons with disabilities and those without. 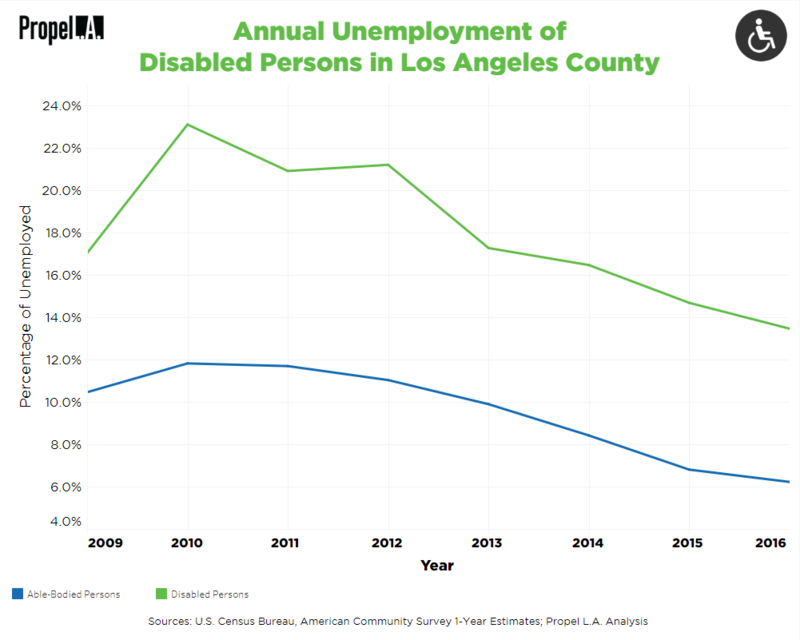 From 2009 to 2016, the unemployment rates for persons with disabilities was about twice that of those with no disabilities in Los Angeles County. The disparity in Los Angeles County is not a regional phenomenon but rather reflects the national trend at large. The Bureau of Labor Statistics (BLS) reported the same ratio of employment disparity at the national level between persons with disabilities and those without. The latest Labor Force Characteristics Summary on persons with disabilities details, “The unemployment rate for persons with a disability was 10.5 percent in 2016, about twice that of those with no disability (4.6 percent)” (BLS, June 2017). The BLS also cited some employment disadvantages among persons with disabilities such as they tend to be older and are less likely to have a bachelor’s degree than those with no disabilities. However, “the proportion of persons employed in government was about the same for both persons with a disability and persons without a disability in 2016.” Since the government is generally held more accountable to equitable practices, including compliance with the Americans with Disabilities Act (ADA), this data suggests that disability employment-related policies can effectively redress the hindrances that persons with disabilities face in the labor force. Technical details: In general, Propel L.A. uses the U.S. Bureau of Labor Statistics (BLS) or the CA Employment Development Department (EDD) for unemployment rates. However, neither sources provide the annual disability unemployment rates in Los Angeles County. Therefore, Propel L.A. utilizes the American Community Survey (ACS) for this metric since such data is available in the ACS.